Haven't been much around lately, but I couldn't miss the appointment with the Etsy Beadweavers team monthly challenge. "Artists have used geometry for centuries to create aesthetically pleasing works, whether it was a matter of determining proportions or using geometric shapes to create abstract designs. This challenge is an opportunity to participate in this grand artistic tradition. Geometry's concern with shape, size, area, and volume make it a resonant field for many forms of beadweaving, most notably those techniques for creating geometric shapes and structures out of beads. 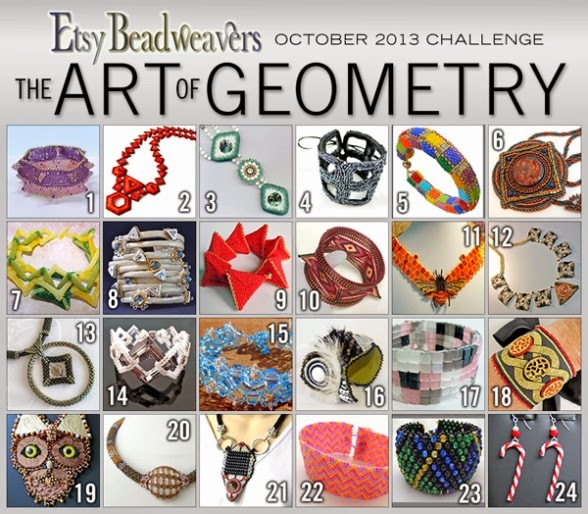 Think broadly with your interpretation of this challenge theme - consider probing geometric issues of two- or three-dimensional beadwork, play with lines, angles, and shapes. Experiment with symmetry, explore the possibilities of repetition with tessellations, work with the geometric forms found in nature, or draw inspiration from classic works of art such as Leonardo da Vinci's Vitruvian Man." Vote for your favorite until October 15th on our team blog!! !